There are those who dream of watching a football match at the legendary Maracanã stadium in Rio de Janeiro, or enjoying an opera at La Scala theatre in Milan or experiencing a film premiere in the middle of Times Square in New York. For lovers of gastronomy and authentic acorn-fed 100% ibérico ham, there is one thing they need to experience at least once in their lives: a visit to the curing cellars of Cinco Jotas in Jabugo. This iconic hundred-year-old building holds the history and secrets of Cinco Jotas inside. 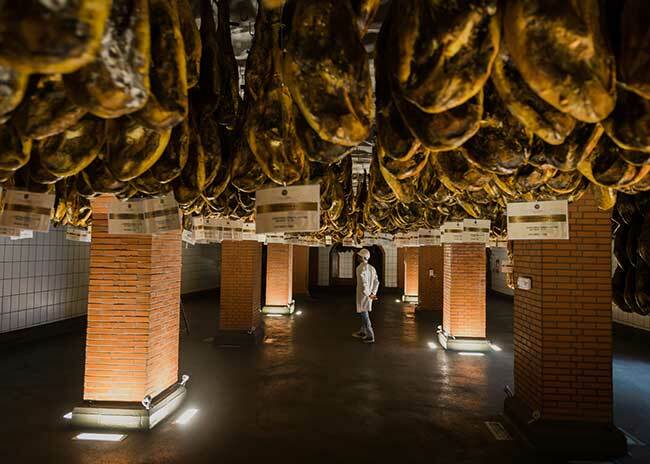 Exploring its drying rooms, salting rooms, tasting hall, and other large open spaces means savouring the legacy of several generations of Jabugo families who have worked hard to preserve the purest essence of acorn-fed 100% ibérico ham. The first thing you see when entering the curing cellars is a magnificent outdoor patio where, many years ago, the “sacrificio” of the pigs was carried out (or, “sacrifice” – the Spanish word for “slaughter”). There begins the hour-long visit during which the ham lover learns about the history of Cinco Jotas through a collection of photographs, videos, display of artisan tools and a detailed explanation by professional Cinco Jotas guides. 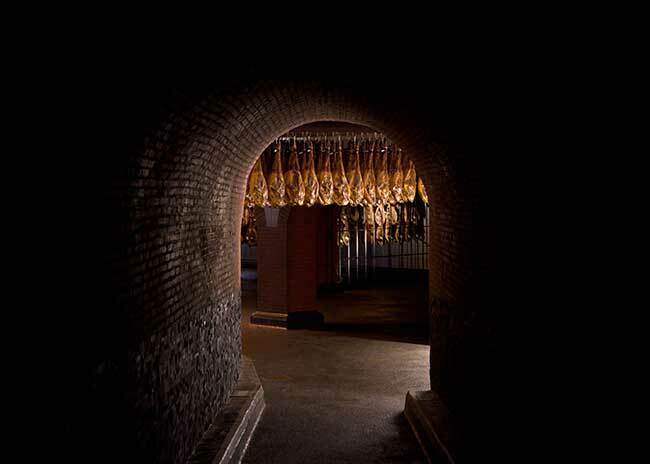 One of the most striking moments is when the visitor arrives at the southern-most hall of the curing cellars, where Cinco Jotas hams hang during the last year of curing. This is where you learn about the natural curing process, with windy drafts created by closing or opening windows, a procedure done the same way for over 100 years. Here, you breathe tranquillity and peace. It seems almost that time has stopped for Cinco Jotas hams to complete their curing process; to allow them an unhurried journey to excellence, free from obstacles and with all the security of being supervised, one by one, by the Cinco Jotas artisan team of professionals. The visit to the curing cellars ends on the best possible note: with an expertly-guided tasting of Cinco Jotas products, inviting the visitor to unveil the experience using all five senses with each luxurious bite. It’s those exclusive nuances that stay with us, and that evoke memories of the Cinco Jotas universe every time we talk about gastronomic culture. This 360º Cinco Jotas experience can be combined with a visit to the Spanish meadows (“dehesas”, in Spanish) to understand the complete breeding cycle of Iberian pig, the “montanera” season when the luscious acorns fall from the trees, and the environmental and sustainable abundance of nature that represents this unique natural ecosystem in the world. A meeting spot for lovers of fine cuisine; a source of inspiration from the best chefs, master carvers, and artisan specialists from Cinco Jotas. In Blog you will find the best of the essence of Cinco Jotas: a gastronomic experience that does not speak of sophistication but invites to recover the connection with nature and its organic richness.